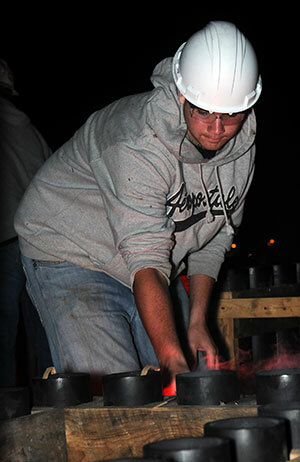 Training | Ocean State Pyrotechnics, Inc.
Shawn Lindell, Lead Pyrotechnician, prepares to fire his next five inch cue. Ocean State Pyrotechnics has a firework training program that is open to qualified (you must be able to pass a CORI and a Federal Employee Possessor) persons. You will receive training in all aspects of display set up, firework safety and handling and firework display shooting. You will have to opportunity to learn from some of the most knowledgeable experts in the industry. Call today and get started in a hobby or part-time job that is just about rewarding and exiting as anything you’ll ever do.